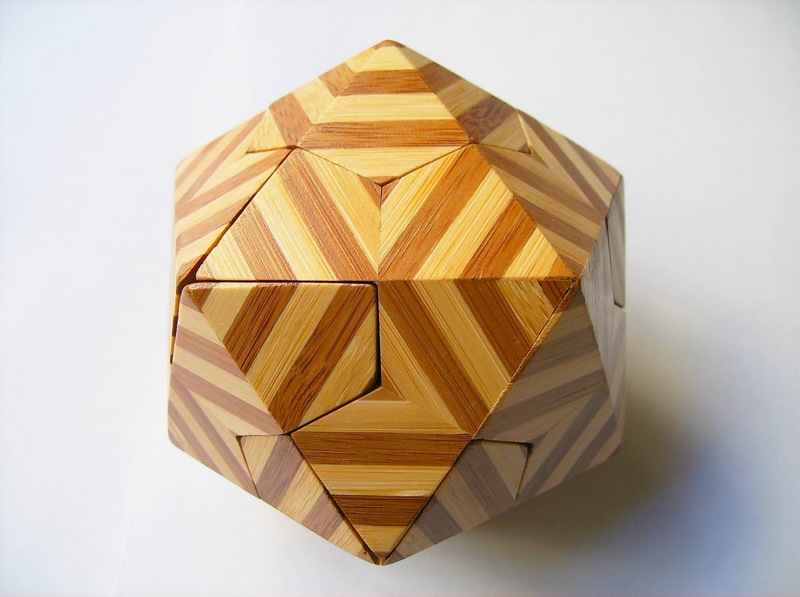 Physicist Wayne Daniel is the inventor of this fantastic puzzle. The All Five puzzle is actually a 5-in-1 puzzle containing the 5 platonic solids - An icosahedron (20 faces), a dodecahedron (12 faces), four octahedra (8 faces), an hexahedron or cube (6 faces) and nine tetrahedra (4 faces). Inside the package, with the puzzles, comes a DVD with special features, such as a presentation on how the puzzle is built and how it is solved, also with the history behind the platonic solids and the mathematics involved. Featured as well, is an interesting biography of the inventor. 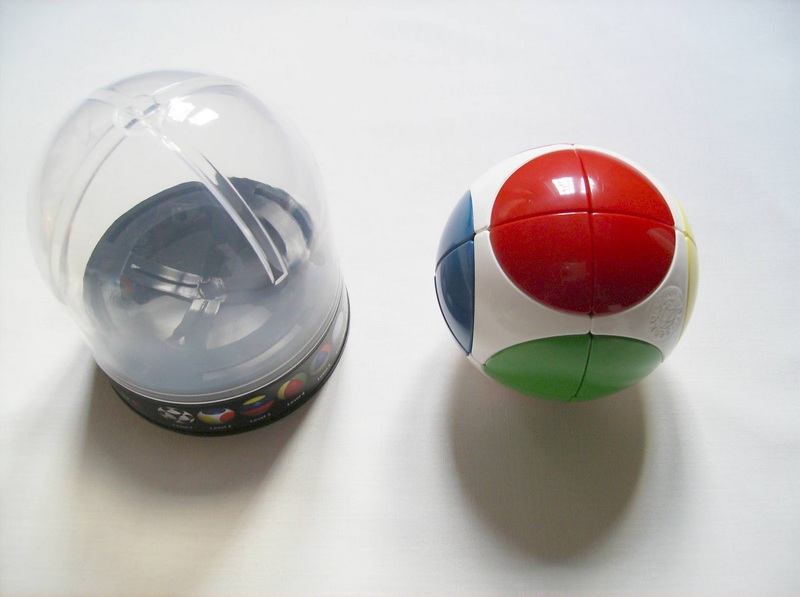 The puzzle contains a total of 37 pieces (when first developed in 2004, it consisted of 41) and the idea is to build each smaller puzzle (solid) so that it fits into the immediate larger one, reminiscent of a matryoshka doll. 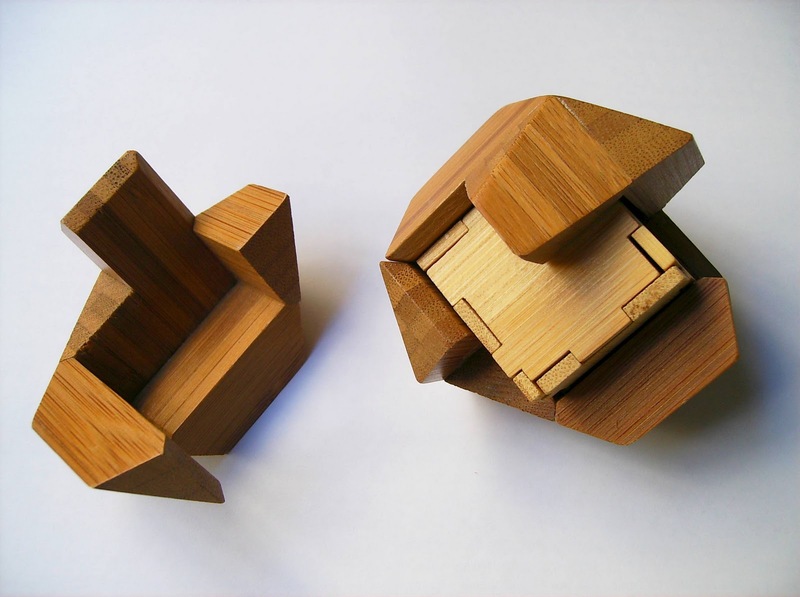 Essentially an Assembly/Packing puzzle, each solid will fit perfectly into the corresponding one, without leaving a single empty space. 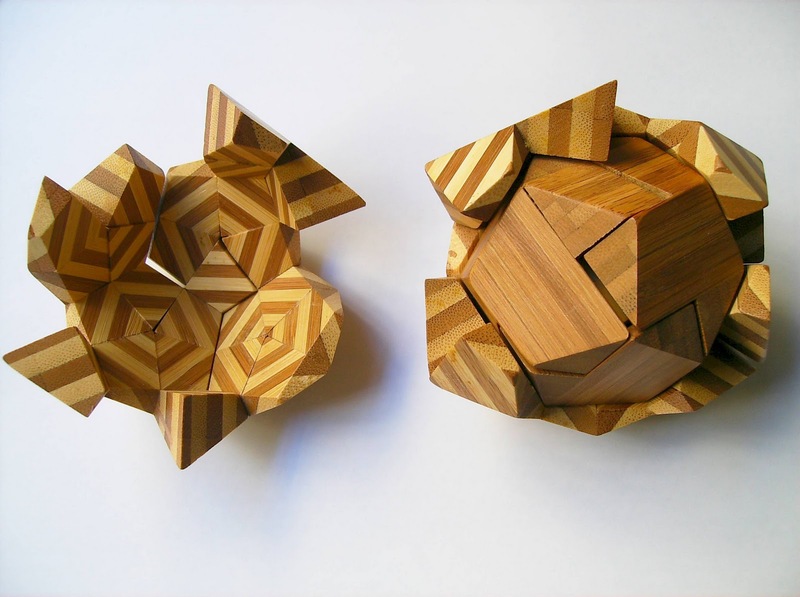 The larger solid, the icosahedron, comes in five pieces, all different. It's a bit complex, but not that difficult to assemble. I love the stripes pattern on this particular solid, which is the one you only see when the whole puzzle is solved. 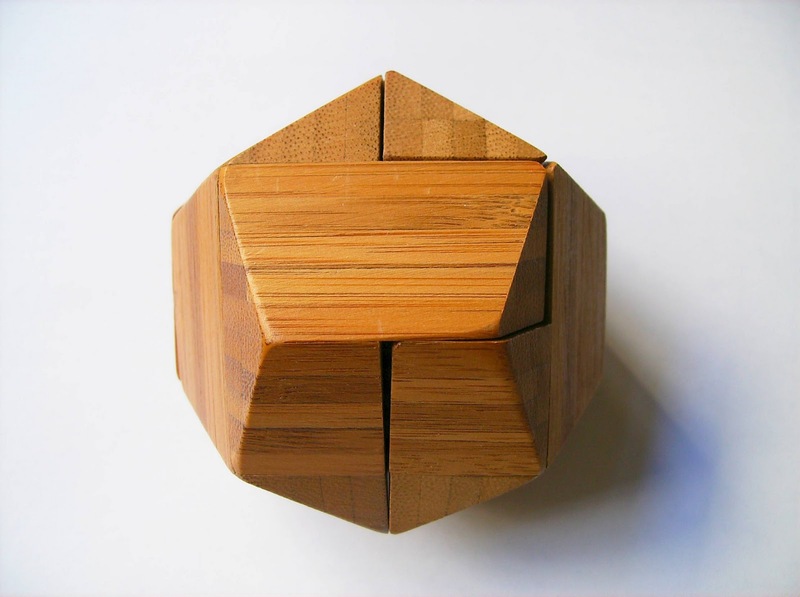 The next puzzle is the dodecahedron, with only three pieces, that will nest inside the icosahedron. With such a small number of parts, this is an easy one to solve. 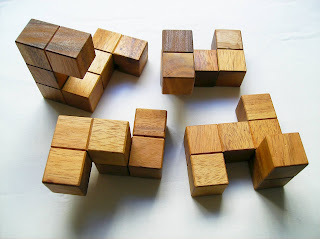 Worth noting though, is the different wood work used on this particular solid, in order to differentiate between the pieces of another one, which is a nice touch, not to have all puzzles with the same appearance. Following the dodecahedron is the cube, an hexahedron with six jigsaw-like pieces, similar to what you see in a Happy Cube. This might seem a little hard at first to solve, but with only six pieces and careful observation, it becomes easier to spot if a piece will connect to another or not, because of the indentations on each piece (no two pieces are the same). The's only one solution to solve the cube. The hardest part of the All Five puzzle is to fill the cube, but first, you have to fill the largest tetrahedron, that will also fit inside the cube, which is very easy to solve by the way, with only two pieces. 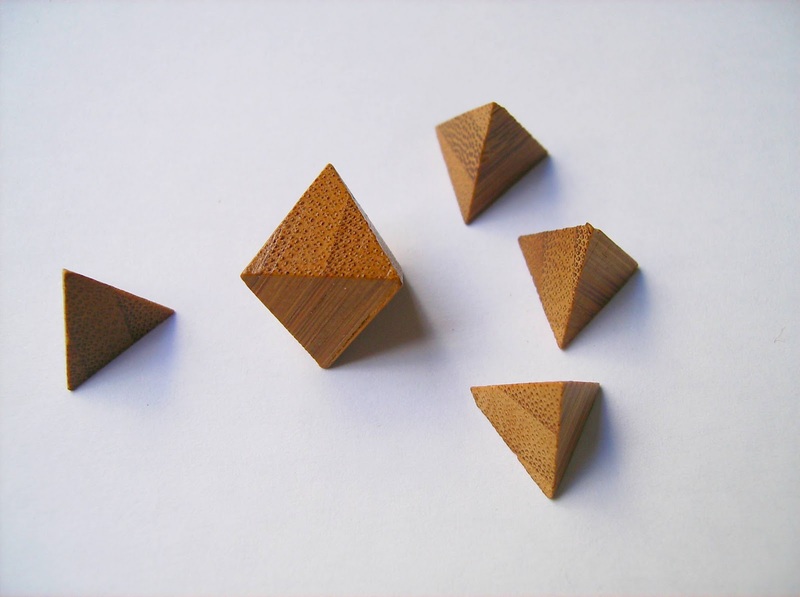 The large tetrahedron is filled by the smaller octahedron found in the puzzle, and four smaller tetrahedra. It's not hard to come up with this solution, but since it's probably the first you'll solve, it might be a little tricky, with all those smaller pieces around, to complicate things. When you have the large tetrahedron solved, it's time to place it into the cube and find a way to get all the remaining small pieces inside as well. The smaller pieces with a stripe pattern are what makes this stage of the whole puzzle, much more complex and devious. If you take a closer look, each four stripe pieces form an octahedron, when correctly put together, but they won't be grouped like this in the actual solution. Instead, alternated with the remaining four tetrahedra, they will fit perfectly around the larger stripe tetrahedron, already inside the cube. After the cube is filled with the smaller solids, the puzzle will now be much easier to assemble, because the hardest part is already solved. The All Five is available at SeriousPuzzles.com for $43.95 USD. Stewart Coffin is an absolute master when it comes to Interlocking Puzzles. He has contributed with so many designs to the puzzle community, that he has his own numbering system for his creations. 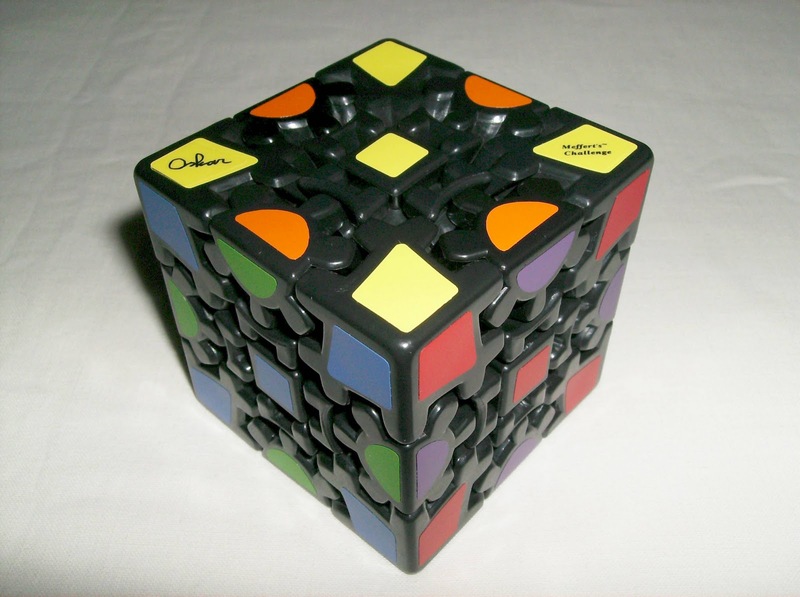 The one in this review is his #93, the Interlock Four or Four-Piece Interlocking Cube. This particular version is built by Puzzle Crafthouse and judging by their high quality standards, this one doesn't disappoint in any way. To create a different appearance to an otherwise plain flat cube, the pieces have been hand sanded to create these beautiful grooved lines. 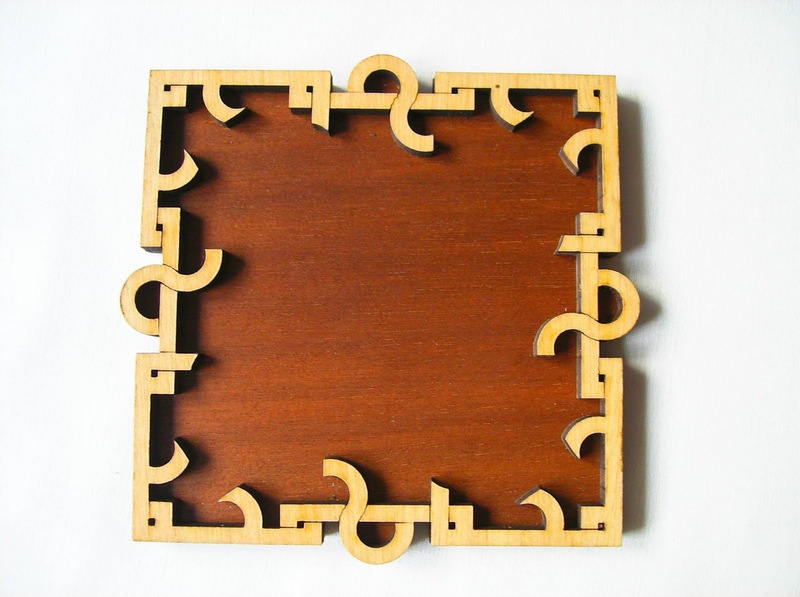 The puzzle consists of four unique pieces. One with 8 square units, one with 7 and two with 6 for a total of 27, making a 3x3 cube measuring 7.8cm (3.07"). The pieces are interlocked in such a way that it requires each one to be taken apart in a correct sequence. Taking the cube apart is not so difficult. 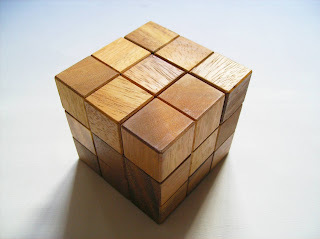 The pieces slide off easily, so it's just a matter of choosing correctly the right little squares to pull off the cube. Once the first piece is out, the others are much easier to separate and the puzzle is all but done. The real challenge, however, is to assemble the cube back to its cube form. 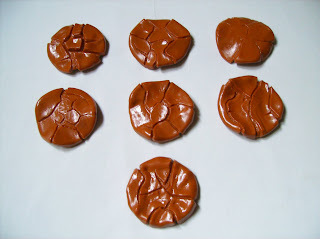 The shapes of the pieces are so complex that it's a really tough task just to connect two pieces. You will be able to join two pieces several times tough, but as you go on and try to fit the remaining ones, you'll face inevitable failure. What you have to keep in mind, while trying to join two pieces together is the actual length of the cube, which is 3x3. If you're connecting two pieces and the fit is more than 3 squares lengthwise, then you'll automatically know that you're out of bounds and you have to try another piece orientation, until you finally have a perfect cube. The Interlock Four is quite different from what I'm used to, in other Interlocking Puzzles - Burrs are the most commonly found and recognizable. However, the difference is very welcome. The puzzle offers an entirely original take on this category and provides a puzzler with a rewarding challenge. 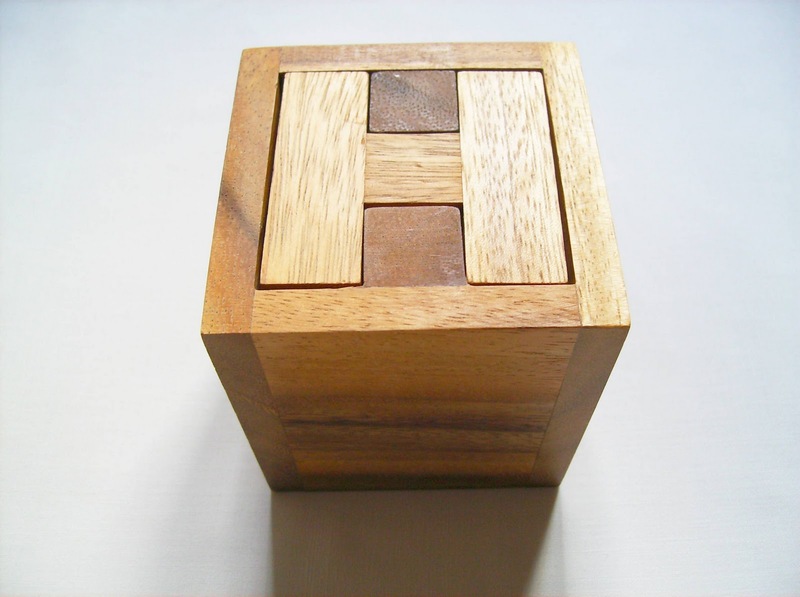 This Interlock Four version can be purchased at Puzzle Crafthouse. 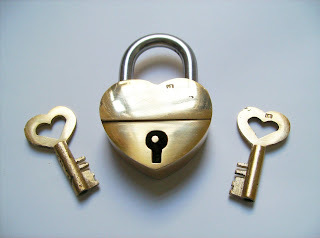 Trick Locks have a long history and are among the oldest types of puzzles, dating back from a couple of centuries ago. 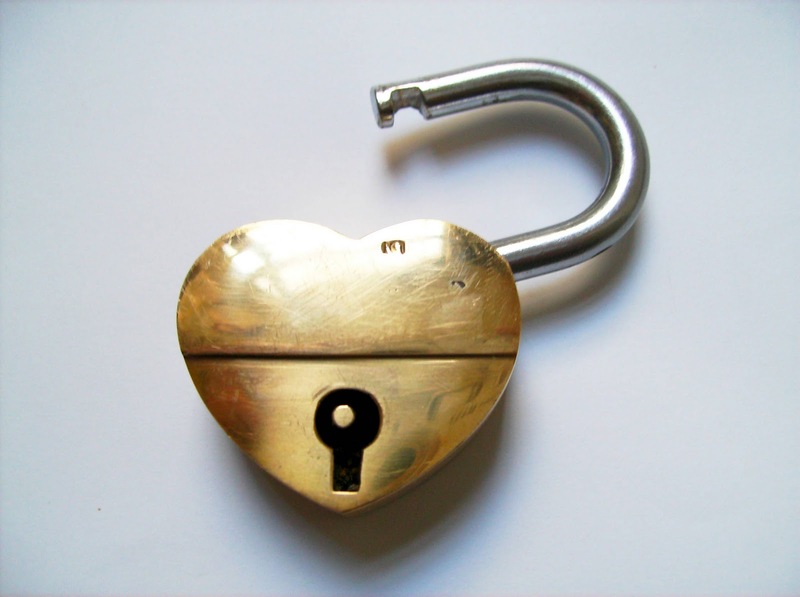 The Broken Heart, also called Ace of Hearts in the Houdini Locks Collection, is PuzzleMaster's version of this simple puzzle lock, built in brass. The heart-shaped lock comes with a spare key and no different from the traditional Trick Locks, you just have to find out the single movement required to open it. It's a bit smaller and lighter than the other ones in the collection, but it's the same good quality, although it can be easily scratched. PuzzleMaster rates it as a level 5/10 puzzle and I couldn't agree more. The lock is fairly easy to open, actually it only took a few seconds to open, so it's recommended as a good introduction to anyone not familiarized with this type of puzzles. Spoiler Ahead: The solution is quite intuitive, at least I thought it was. When you first introduce the key and you realize that it doesn't do nothing, the next thing to do is pull the key out just a little bit more and try again. The lock will open after a couple of tries like this. To close it again, just do the same movement backwards, while keeping the shackle down. The Broken Heart is a nice little lock, well designed and easy to solve. This easiness to open it is the only drawback that I have to point out though, because if you're an experienced puzzler, you won't feel challenged enough. Although, if you're a collector, it's a great acquisition for its original and unique appearance. 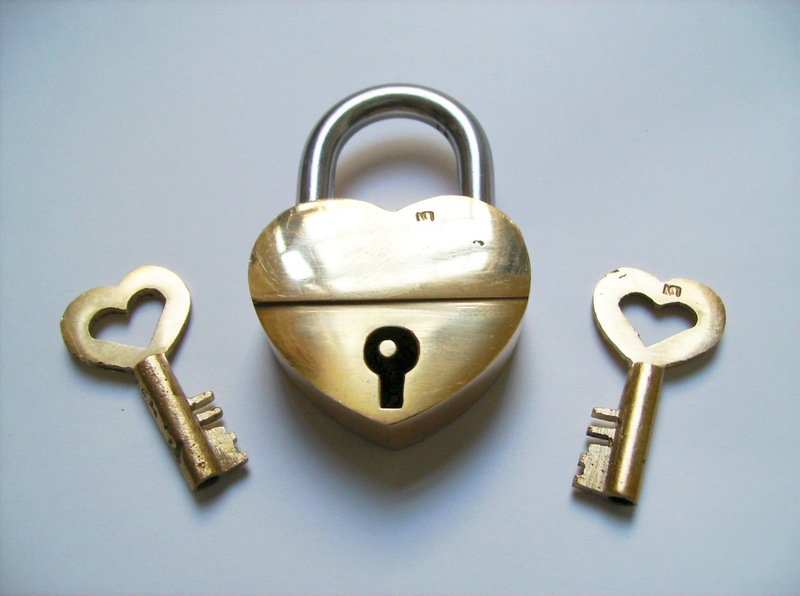 The Trick Lock - Broken Heart can be purchased at PuzzleMaster for $14.99 CAD, along with other great puzzle locks available. 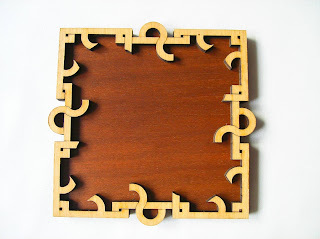 I don't know why, but I love laser-cut puzzles. Maybe it's because of their precision cut lines and beauty of the small pieces, which is harder to achieve with other types of puzzles. My latest acquisition deservedly falls into this category. The Paradigm Puzzles are a really nice small collection of six wooden Packing Puzzles by Family Games America and designed by William Waite. 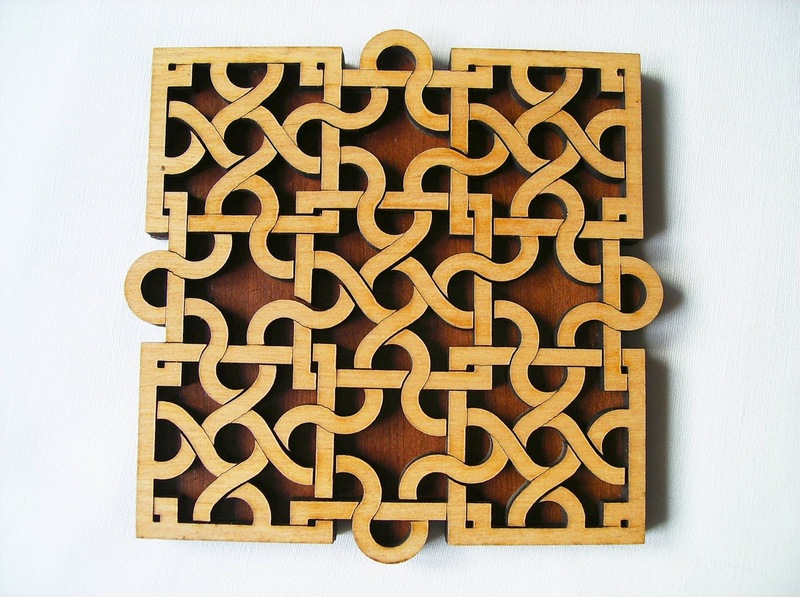 They are beautifully laser-cut into these intricate patterns and vary in difficulty. The one I have, Interlace Square is based on an Arabic pattern and it's the hardest of the six (classified as 9/10). I suggest that you spend a couple of minutes just to study the puzzle in its solved state, before dumping the pieces on the table. When you first attempt to solve the puzzle, it's hard to visualize the whole pattern, so that's why it's better to know how the puzzle looks like when solved. You do have a picture of the puzzle, engraved on the back of the tray, but this becomes hard to look at when you're putting the pieces and attempt to flip it. - One of them is that each piece appears to be usable on both sides, but that's actually not true. Only the front side of a piece is valid, because the backside doesn't have the lines of the pattern engraved on it, so that's half of the possibilities cut down. - Another small detail on the pieces that you can take advantage is the natural lines on the wood, which are well defined straight lines and will help you figure out the correct orientation, which will be just two instead of four. If you're stuck and want to find and easier solution, you can disregard this. 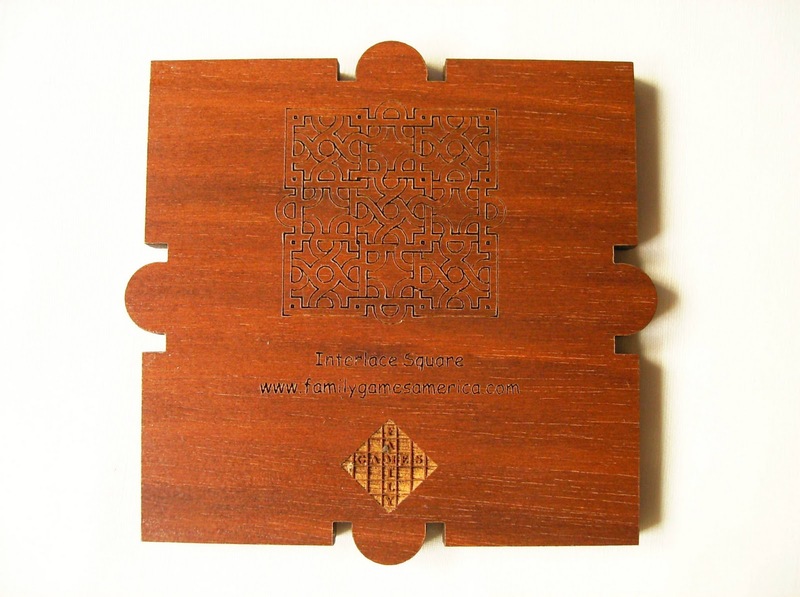 The Interlace Square is not only a beautiful puzzle to look at, but a good challenge as well. The complex lines on the pattern are what makes it so difficult and at the same time, really fun to solve. Recommended for the Packing type enthusiasts. The Paradigm Collection can be found at SeriousPuzzles.com for a reasonable $14.95 USD. 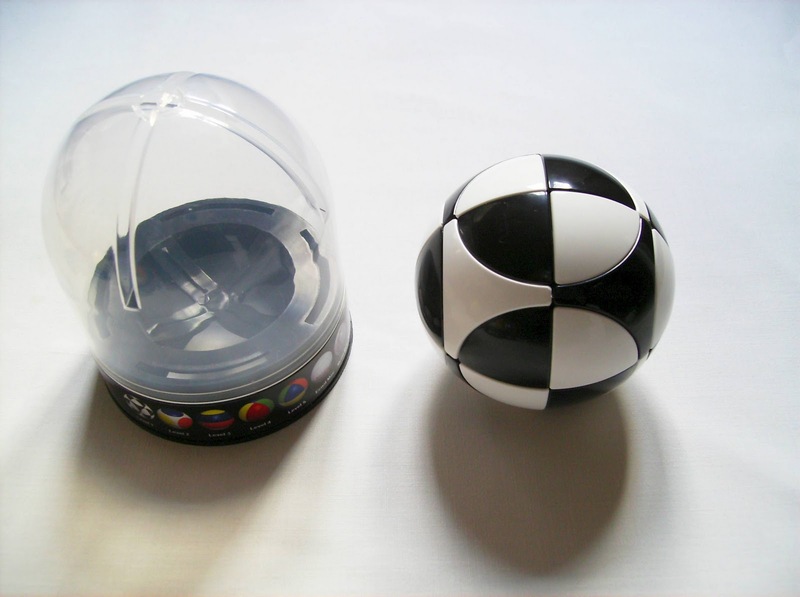 These 5 little Twisty Puzzles are called the Marusenko Sphere. 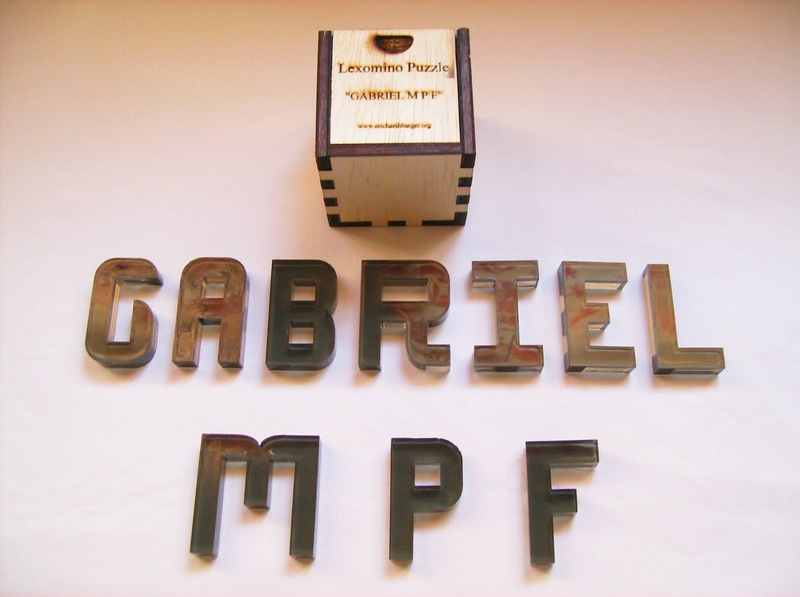 Almost two years later after their entry in the IPP 29, they finally became available worldwide at the beginning of this year (2011). Produced in Spain and designed by Felix Perez and Alexandr Marusenko, the spheres come in five different levels of difficulty with ten color schemes - Five color versions for level 1, two for level 4 and the remaining three levels, all with a unique color scheme. 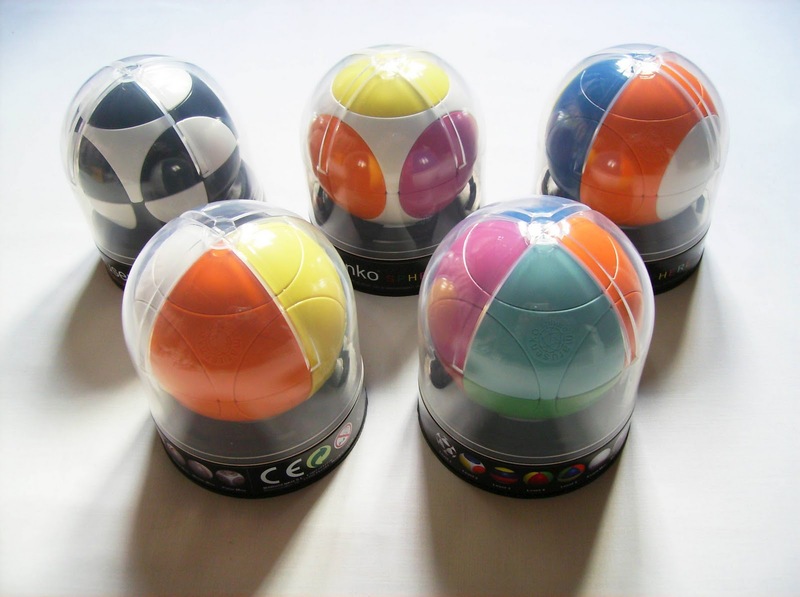 Each sphere comes nicely packaged with a stand and protective transparent case, which makes for a great display item. The scheme of choice is colored plastic instead of stickers, which by the way is absolutely spot on. 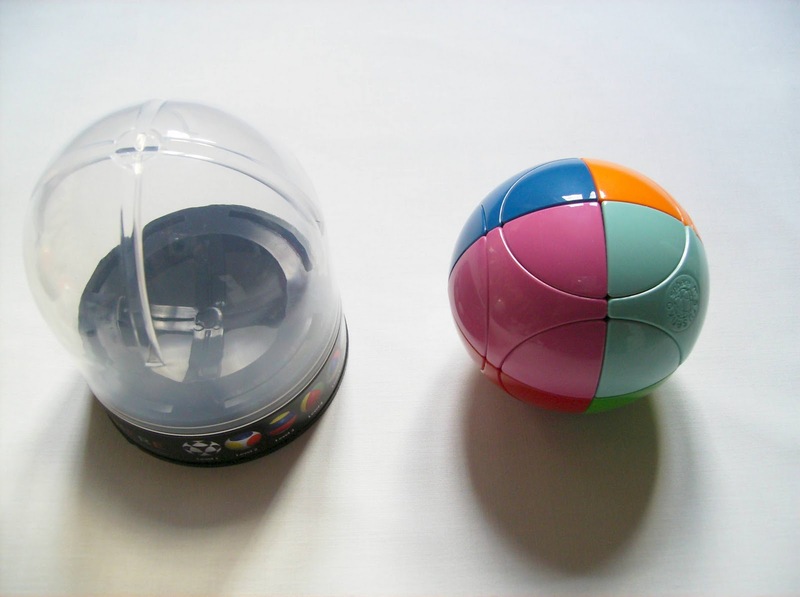 I actually prefer colored plastic in sphere Twisty Puzzles, rather than stickers, because the actual form of the puzzle is much more prone to have the stickers peeling off, after a while. I tried to take the sphere apart to show the core, but it was really difficult and I was afraid to break something. In the tutorial though, the assembling process of the sphere is described as not using glue or any metallic elements, for example, springs or screws, commonly found in other Twisty Puzzles. 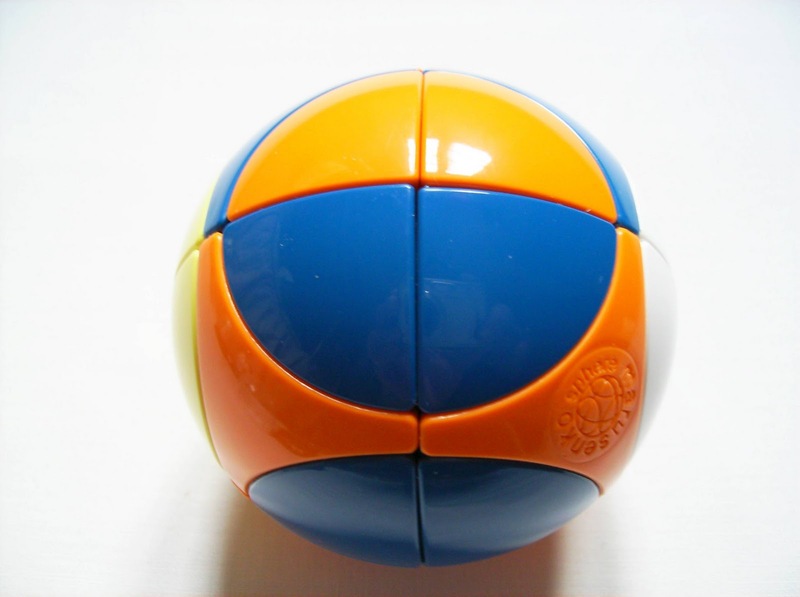 The basics of the Marusenko Sphere, regarding its mechanical movements, it's like a rounded 2x2 cube with a twist. The twist is the four central triangles in each of the six poles. This kind of resembles the challenge found in the line of Crazy Cubes and also the 2x2x4 ShengShou, reviewed by me last year. What I liked most in the ShengShou was precisely the center triangles and this new additional challenge, of having to orientate them correctly. 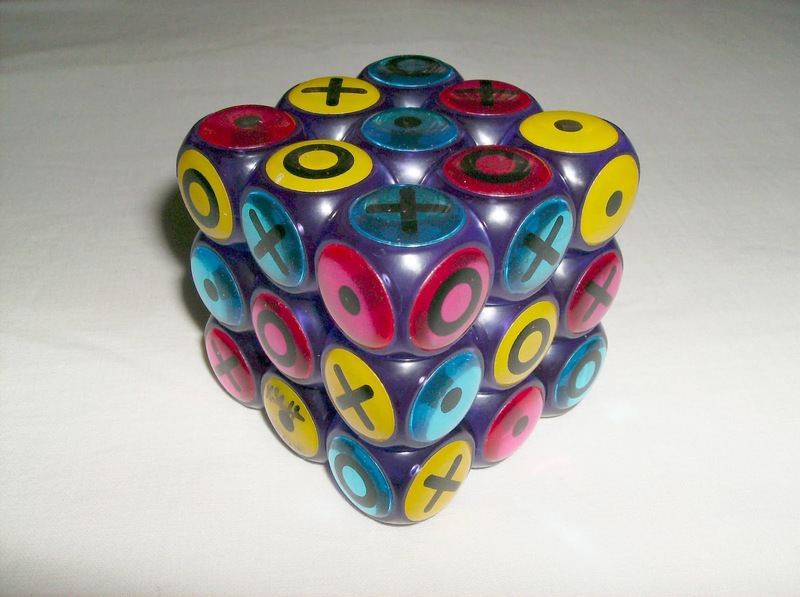 So, basically if you can solve, even a 2x2 cube, then you'll definitely be able to solve (in theory) any level of the Marusenko Sphere. Even though the higher levels are much more tough to work out, the principle is the same. It's recommended to start by a lower level to get the hang of it, but if you're an experienced twisty solver and you can't get all of them, then go for it, because it's quite easy to pick up right away. Besides, all of the levels come with their respective tutorial, if you get stuck, so no worries. 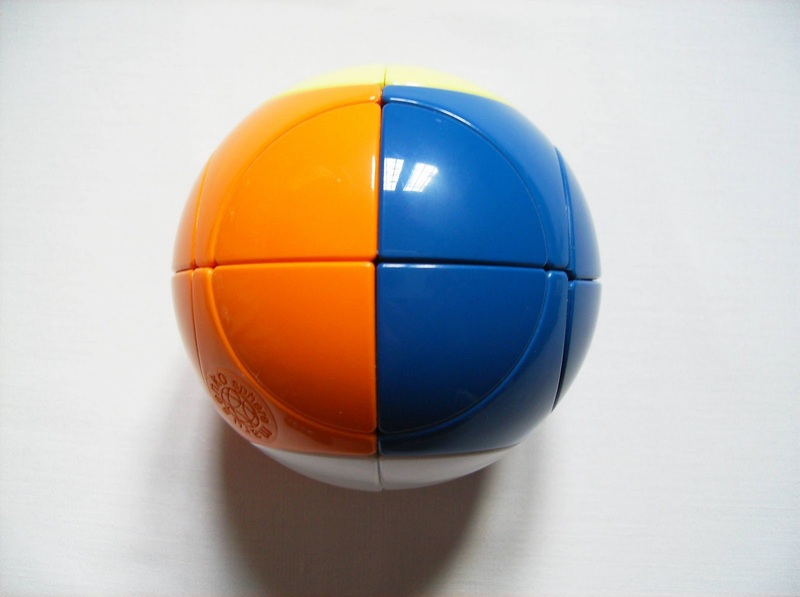 This is the easiest Marusenko Sphere to get started and it has only two colors, making a nice contrast. There are many color possibilities for this scheme and that's also why you see five different versions of this, giving you the possibility of choosing your preferred color combination. 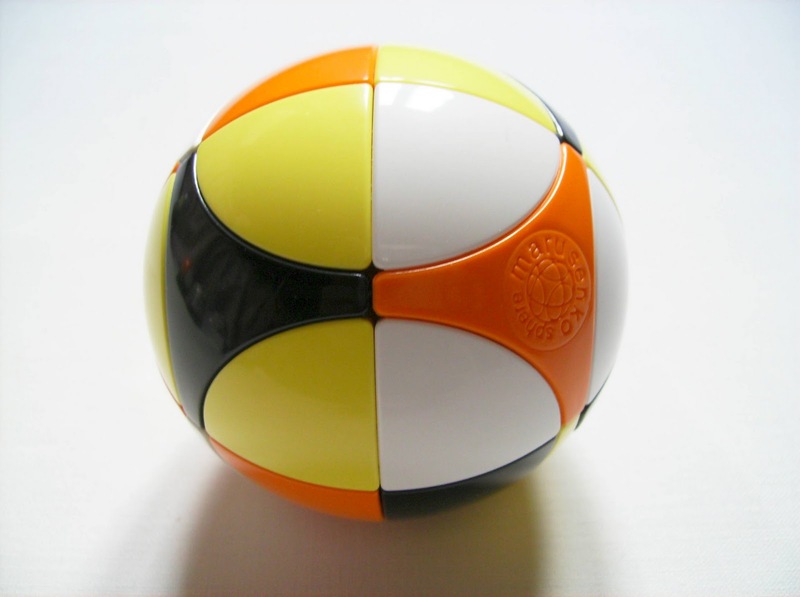 One of the perks of having only two colors, is that you can solve the sphere into many possible patterns. It comes in a checkered pattern, but the Marusenko website shows eight more different ones, although I'm sure you can do even more. This is my favorite in terms of appearance. The main body is all white, leaving only the six poles, each with a different color. 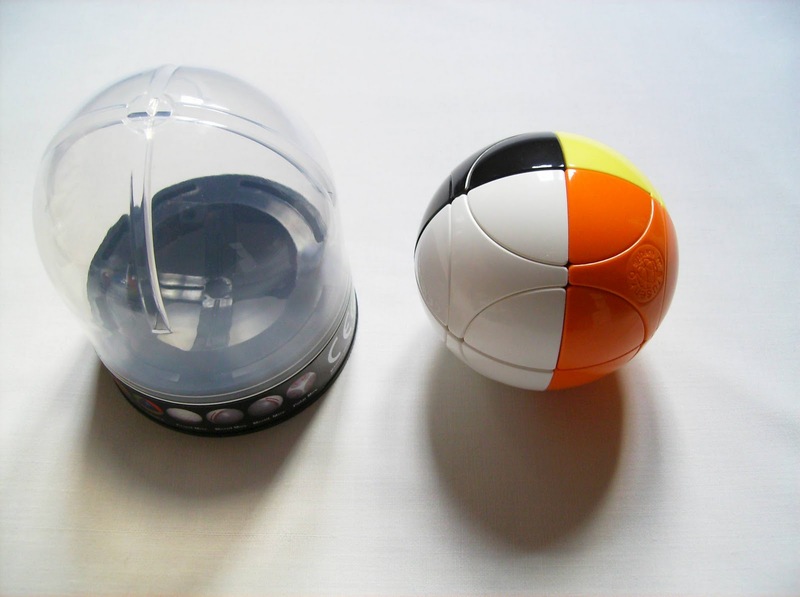 This is the perfect sphere to train for the higher levels. Focusing on this challenge alone by having only the poles to worry about, will give you an insight on how to tackle this particular task on the other spheres. It may seem difficult at first, but you'll get there eventually. To ensure a proper scramble of the sphere, make sure you have four different triangles in each pole. There isn't other patterns you can do with the Circular Sphere per se, however, you can try to group different colors together, adding this way another degree of difficulty. The third level starts to add a bit more difficulty. With two colors for the main body and two more on each opposite poles, it gets harder to solve. This is my favorite one for solving. It's right there in the middle as not so hard, but with just the right amount of difficulty to have fun and being challenged enough without too much stress. 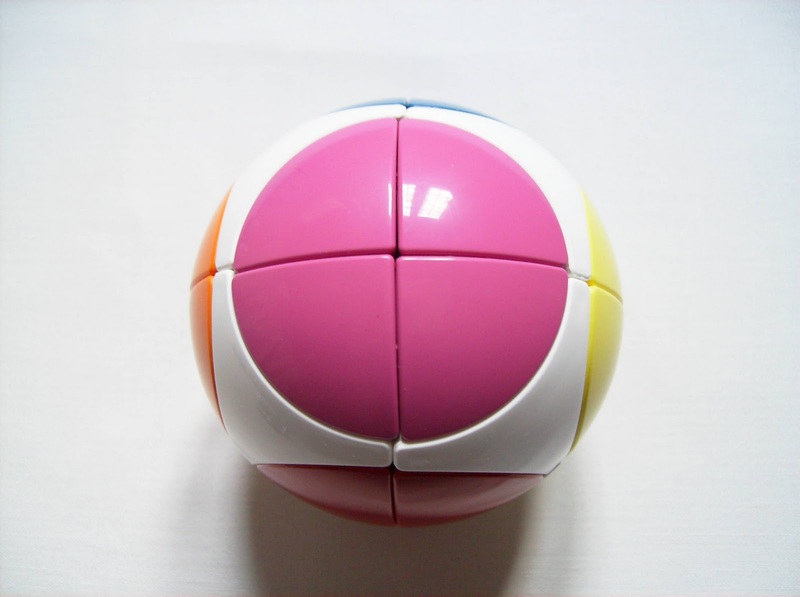 When you have the sphere well scrambled, the first thing you should do is getting the body colors in their right position and just then, you may finish solving the poles. 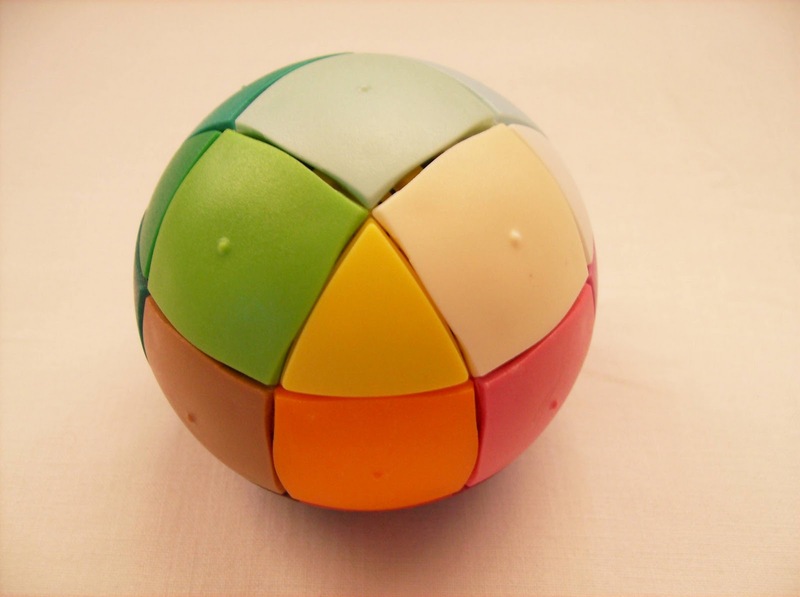 The Flag Sphere also provides a variety of different patterns for you to solve. You can see a couple of examples in the pictures below. There are two versions for this level. Besides the Contrast Sphere, with black, white, yellow and orange, there's a classic color scheme available with yellow, red, green and blue. They're exactly the same difficulty, so it's up to you to choose. The tips for solving this one are pretty much the same as the level 3. Getting the main body parts in the correct position is a bit trickier, but easily done. The harder is to get the triangles in their places, as there's only two possible ways for doing this. To be more exact, it's six correct positions, around the two respective body parts for that color. ... And we're finally on the hardest sphere to solve. With eight different colors to worry about, one for each main triangle, this'll be as tough as it gets. One thing that you'll realize when you try to solve the Circular Sphere, is that there's no need to get the main body parts in their correct places. Since they're all a different color, what you have to do is "just" get each of the three triangles of the same color around their respective body color, although "just" is an understatement. This challenge alone will prove to be enough to test your resolve. Besides all the different color groups you can solve the sphere into, you can try at least another one, which is color contrast. Choose between two colors at a time and solve it by exchanging their corresponding triangles into the opposite main body color. Example in the picture below. What I loved most about the Marusenko Sphere, in general, was the wide range of color schemes to chose from and the different levels it has. Extra points for not settling with just one version and be done with it. 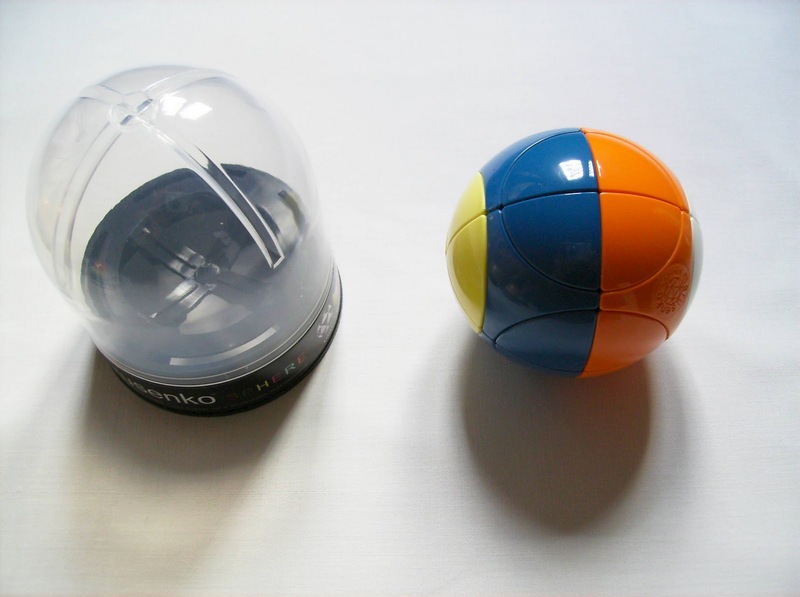 Although the basic principles were out there already in other puzzles, the Marusenko Sphere is different in its own way and manages to achieve what others didn't - Variety. Invented by McLoughlin Bros in 1888 and later published in the "New Book of Puzzles" by Jerry Slocum and Jack Botermans in 1992, the Giant Puzzle was then picked up by Creative Crafthouse, who now produces this version. You can see the original puzzle here. Now with a modern makeover and easier to manipulate, thanks to the handles in each piece, the basics of the Giant Puzzle remains the same. You're given 25 pieces, 5 of each color and every one of them has a different odd number from 1 to 9, so no two pieces are the same. The puzzle comes in the state as you see it in the above picture and your task is to place the pieces in the tray so that no number or color is repeated in any row, column or any diagonal. You also have to keep in mind that in every row, column and the two major diagonals have to add up to 25, although this is achievable if you get the colors and numbers challenge right, so you don't have to think about that. The Giant Puzzle is rated as very hard, but I actually found it to be quite easy and simple. The logic is very much similar to what you're used to in a regular Sudoku game, where you use elimination to find a correct placement for a number, in this case a piece. If you're not familiarized with the Sudoku concept, you can try separate challenges first: You can start by getting just the color pieces in the tray, so that they follow the puzzle's rules or if you prefer, start by the numbers instead. Once you have that logic learned, the full task may seem a lot easier then. The next two paragraphs contain spoilers on how to solve the puzzle. If you wish to try it for yourself and prefer not knowing the solution, jump to the "Closing Comments". Ok, so when you see the puzzle for the first time, you'll notice that every row is the same color and every column has the same number, but if you look closely at the main diagonals, you can see that both of them follow the three basic rules (no repeated color, number and add to 25). Then, you just have to start placing the pieces in the order you saw them in the diagonal, but now in a row or column, which way you prefer. Assuming you started by a column with the "Yellow 1" piece, followed by the "Red 3" and the "Blank 5" like I did, the next piece you should think about is the "Red 1". You can't place this one at the start of the second column, because you'll repeat the number 1. You can't place it in the second space, because you'll repeat the color red and the diagonal with the "Yellow 1" in the first column. You can't place it in the third space either, because it'll be in the diagonal of the "Red 3". So, by the logic of elimination, it can be placed in the fourth space. Following the same thinking, the next piece has to be the "Blank 3". Since there's six spaces in every row or column and you're now occupying the last two spaces of the second column, the logic continues at the beginning of the same column and down until completed. Repeat the same steps for the remainder of the columns and you'll have the Giant Puzzle solved. Although I found the puzzle to be easier than I was expecting, it doesn't spoil the fun of solving it in any way, and if you're a collector like me, you'll most certainly want to own a high-quality copy of this classic puzzle in your collection. The Giant Puzzle can be found at PuzzleMaster for $24.99CAD. Here's more puzzles from Creative Crafthouse. The Brain is a very interesting puzzle, using the Gray Code concept (after Frank Gray) or reflected binary code, which is a binary numeral system. It's produced by the American company Mag-Nif and dates back from 1973. It's still sold today and is actually one their most successful brainteasers to date. 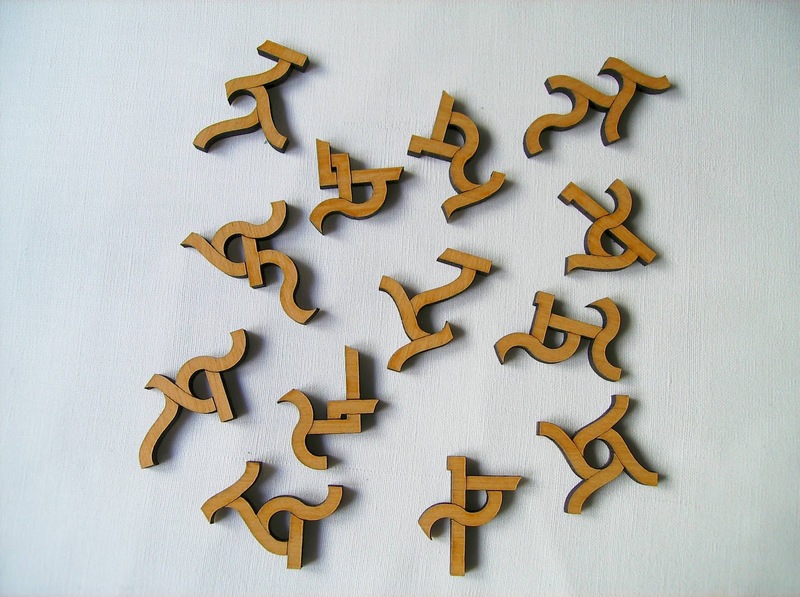 The objective of the puzzle consists of getting all of its eight pegs out, but to achieve that you have to do a sequence of 170 correct moves. Sounds scary, but don't be intimidated by the big number. This may take some time to get used to if you're a casual puzzler, but it becomes quite easy and simple once you understand the logic. Limiting your movements is a stack of disks that are locked and with every step, you will unlock them one by one until you have all the pegs out. Each peg is numbered from 1 to 8 and they can only have one of two possible positions. When they're closer to the center, they have a value of 0 or In, and when they're outwards, they have a value of 1 or Out. To move a specific peg, you need to make sure that you have the immediate lower numbered peg out and all the remaining lower ones in. This process is exactly the same until you have all the pegs out. The current design of The Brain is pretty much the same from the original version, but the color has now been changed from black to red and the transparent plastic has a black and silver glitter effect. I don't have the older version to compare, but from what I've seen in photos, I like the appearance of this one better. The Brain is a great example on how to turn an otherwise boring mathematical problem, into an interesting challenge and very fun to solve. It's a shame there's not many puzzles out there that use the Gray Code. I, most certainly, would love to try other puzzles like these. 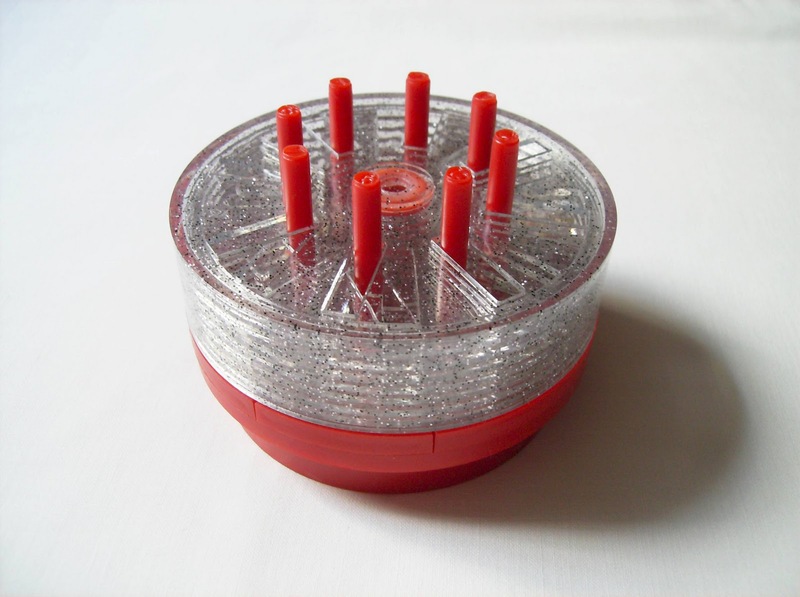 Besides this one and the Spin Out, I only have the Chinese Rings and Tower of Hanoi. The Brain can be purchased at SeriousPuzzles.com. The Japanese Toyo Glass Company has many interesting packing puzzles, where you have to fill a glass with a particular number of pieces. Usually the theme is related to various types of foods. 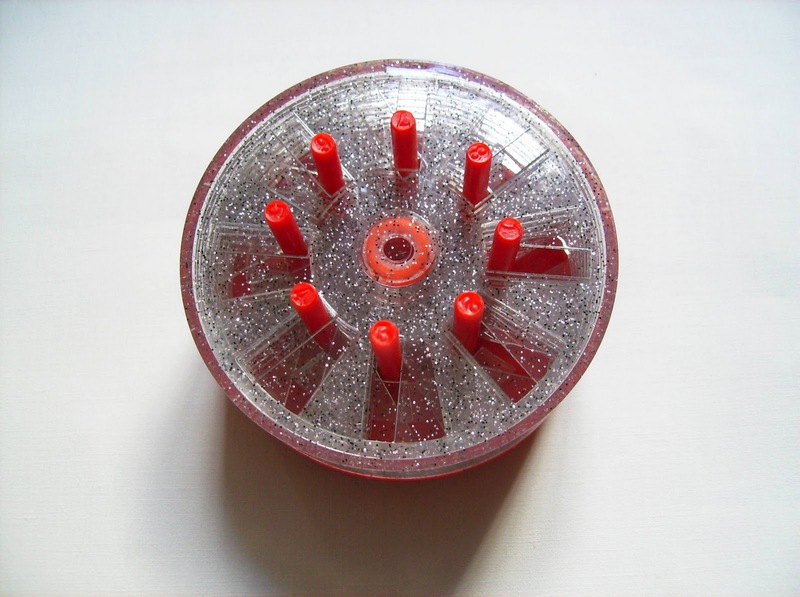 The one I have for review today is the 'Rice Crackers', which is part of a collection re-issued by Beverly Enterprises. Although the package is almost entirely in Japanese, you can see a logo saying "NOB collection", indicating that they were designed by the late Nob Yoshigahara. As the name suggests, you have seven rice crackers, all with different and irregular thicknesses. 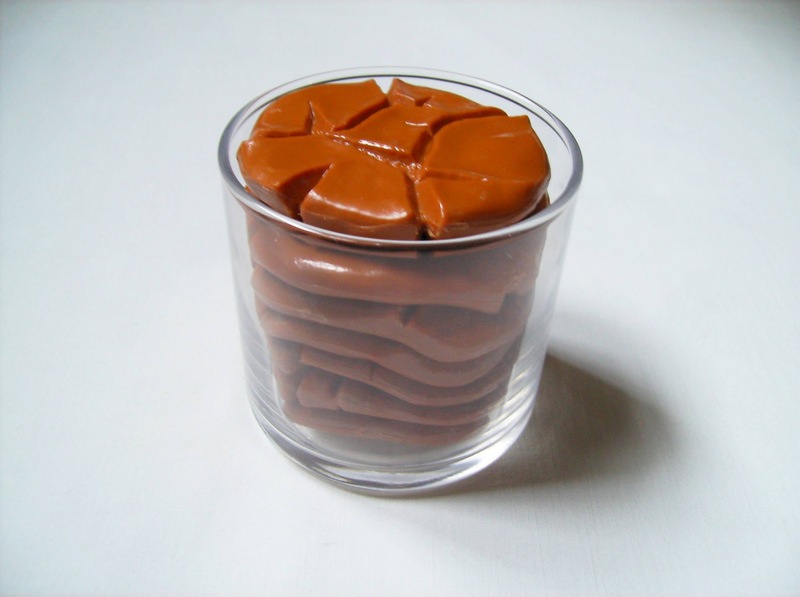 The goal is to pack them tightly, so that they fill perfectly the glass edge's height. Regarding difficulty, the 'Rice Crackers' isn't that hard. Puzzlemaster rates it as a 7/10, but I think it's a lot easier than that, because I was able to solve it in about 5 minutes or so. Given the fact that you only have seven pieces, the puzzle is pretty straightforward. From those pieces, two of them have a side that's almost flat, compared to the other irregular ones, so it's just a case of trial and error with the remaining ones until you find the correct fit. Some of them will appear to fit in more than one occasion, but this'll be as tough as it can get. 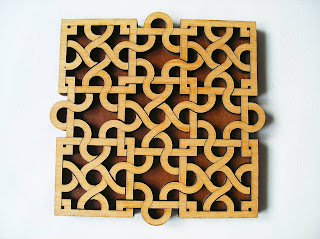 Although it's an easy puzzle, I like its originality for using a material you don't usually see in mechanical puzzles. I'll definitely be looking forward to get some more of the others, from the same collection. The Rice Crackers, as well as the rest of the Glass Puzzles Collection can be purchased from the PuzzleMaster's website. This will be the first of several reviews I'll be writing for Puzzle Crafthouse's puzzles, all in the coming weeks. 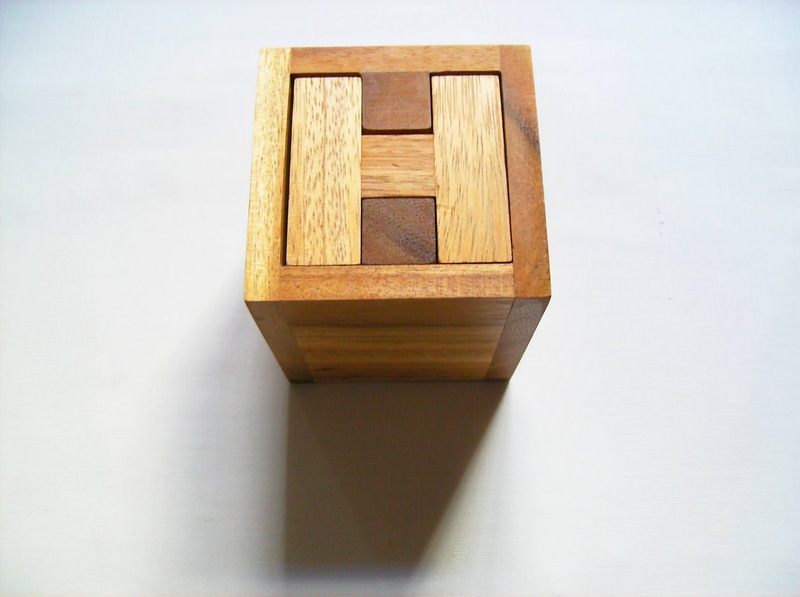 Doing the first honors is the Haselgrove Box designed by the British inventor Jennifer Haselgrove and produced at Puzzle Crafthouse. 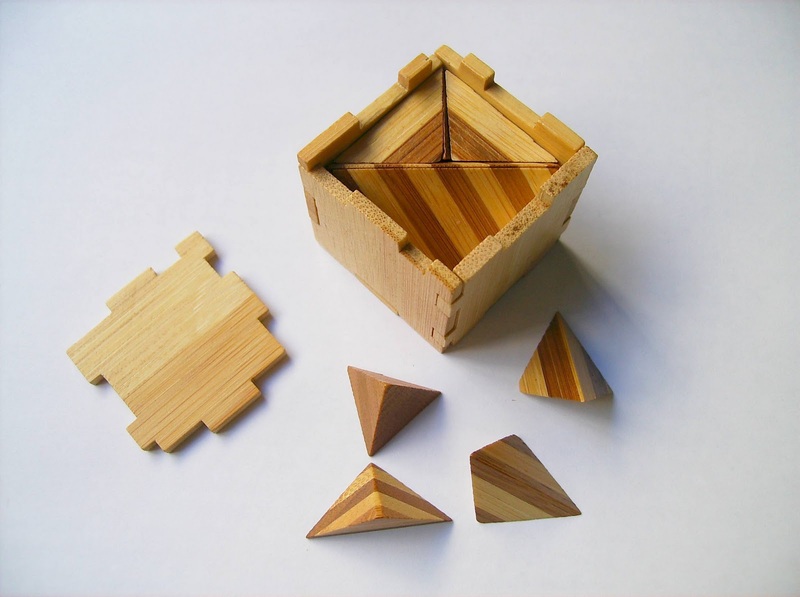 Described as being based on the old Egyptian pyramids' locking mechanism, the puzzle uses an ingenious sliding block system to lock the pieces inside the wooden box. The goal, as you may have guessed by now, is to remove the pieces by figuring out how they're locked. As you first inspect the box and try to remove the first piece, you'll notice that only a small block comes out, but this is actually part of a larger piece. 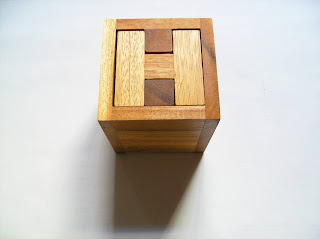 Another careful inspection will reveal a much larger piece in the shape of an H and what appears to be a piece glued to the box's edge. 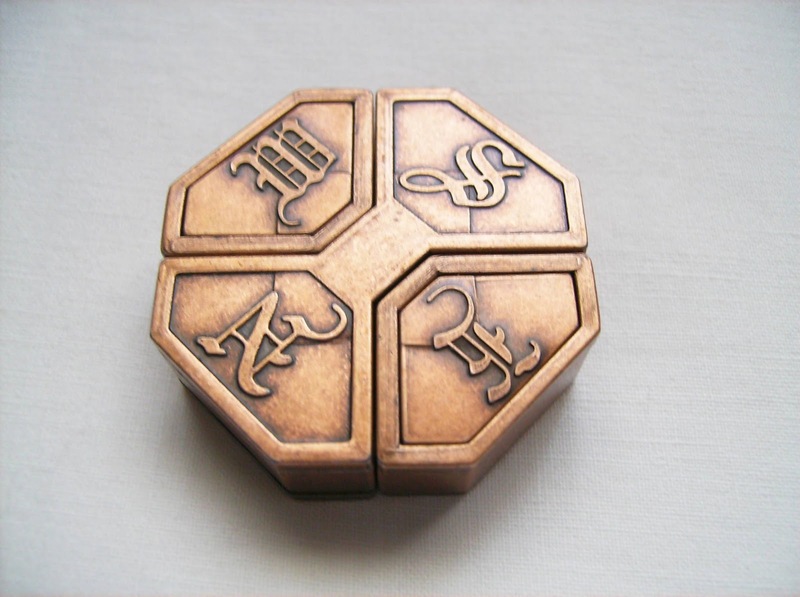 After that first block is pulled and you start tilting the box to the sides, you'll hear something move inside. This is the blocks sliding around with your movements. The hard part about this level 4 puzzle (harder levels are 5 and 5+), is realizing how the blocks slide and what movements you should do in order to take out the pieces. Since you're not seeing how the actual pieces move about, you must use your hearing to decode where the block is moving from and to. It may seem very complex, but I can tell you that it won't take that long to solve the puzzle if you're persistent. If you do solved the first part, which is taking out the pieces, and thought it was very hard, wait until you start thinking about the way to put them back in the box. After successfully removing all the pieces, you won't be aware of all the exact steps used to get there. When I got the blocks out, I wasn't paying much attention to their correct place inside the box and just drop them on the table - Big mistake!... Or not. Actually, the fun part and the beauty of the puzzle itself was studying it and figure out where to place every block, to discover how the locking mechanism really works. The first thing you'll notice when you have all the pieces out is that there's not only one glued block to the box, but two of them. This will prove to be part of the overall mechanism that makes the blocks slide and not jam in each other. Another neat detail about the puzzle design is that the larger main piece, when looking at it sideways, looks like a J and when viewed from above, looks like an H - The initials of the inventor. Understanding how the pieces move is halfway to solve the puzzle. When you lift the first block, it will create an empty space inside the box. This in turn, allows the other blocks to move around and create a unique sequence of movements that will be the key to unlock the main piece. Looking at all the pieces, you can separate them into four different types. In fact, there's three unique pieces and six identical blocks. Knowing the positions of the two larger pieces is easy, since there's only one way they correspond to the box configuration. The tricky part is learning where the L-shaped block will go and how to position each of the six blocks. Ok, so if you think about it, the L block has to be placed in a corner and be stationary. The only blocks that will be sliding are the identical ones, and the only effective way of doing this is if they move around the central glued block. If you get the bottom part correct, the rest will follow in no time. To get to the final layer of sliding blocks, you'll just need one that links these two layers. This block is the only one that needs to be in the upright position and will go up or down, depending if you're locking the pieces again or taking them out. Video - Video made by Puzzle Crafthouse to show how the Haselgrove Box works (Spoiler). Lately, I have become more aware of puzzle locking systems with the Trick Locks, but usually they're more like one or two basic moves. On the contrary, the Haselgrove Box is a fantastic puzzle in the way that it uses a unique sequence of movements. Having to unlock it and then knowing how to lock it again is what makes this a very interesting puzzle. In general, a great experience, recommended to those interested in any type of locking mechanism puzzles. Also worth mentioning is the overall high quality of the wooden puzzle, and this is a Puzzle Crafthouse hallmark with all of their puzzles. One hundred posts! It seems like yesterday that I've started to write on this blog. At the time, I was just listing my new puzzles and give them just a brief description, nothing more. Having said that, the first reviews are hardly worthy of that connotation. As time went on, I got more and more familiarized with the review concept and my writing just began to flow more natural. As some of you might know, I'm not a native English speaker, so I'm more prone to get a few errors here and there, but I'd like to think that I've been getting better with time, as this has also been a learning process for me. I began on May 2010 to be exact and since then, a lot of puzzles were reviewed. Many of them were great, but only a few were really amazing. To commemorate my 100th post, I decided to make something different and thought of making a top 10 from all the reviews I've written before. 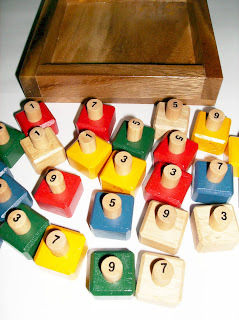 So, after browsing through past reviews, I've listed below my top 10 puzzles, from last to first. To get a more extensive explanation, click on their titles to read the original review. This was one of my first Cast Puzzles. At the time, it was the one that caught my attention the most and still today, after having almost 30 of them, is my favorite. What I like most is the appearance of it, the N E W S font is absolutely superb and the golden color gives it an ancient look. This is what Hanayama does best - It takes an otherwise boring puzzle and turns it into an amazing work of art... Even the packaging looks good. As most of Hanayama's puzzles, the goal of the Cast News is to separate both pieces. This is a level 6 puzzle, the highest and can be a real tough challenge for a beginner. The White DOTS is an invention of Pantazis Houlis from Greece. His line of gravity puzzles are some of the most original puzzles you can have the pleasure to play. This particular one has many challenges you can do, from beginner to advanced. 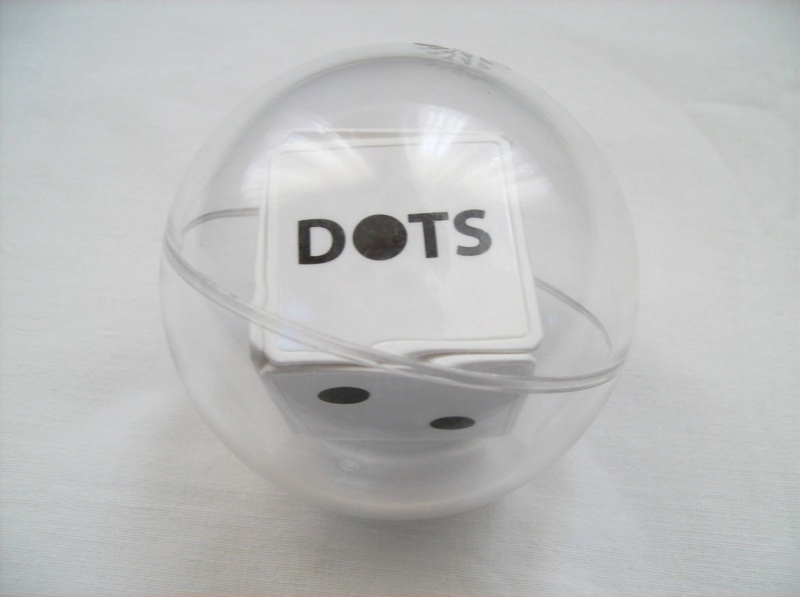 Without touching the actual pieces inside, you have to tilt the ball in order to flip the 5 pyramids and solve a specific puzzle. There's a free space between the pyramids and this allows them to flip and turn inside the ball. It's a joy to play with it. The White DOTS has been re-branded and is now called Oginov. Coming all the way from Finland and designed by Hannu Hjerppe, the Bolaris are actually a collection of 4 puzzles, with each one having a different color scheme. 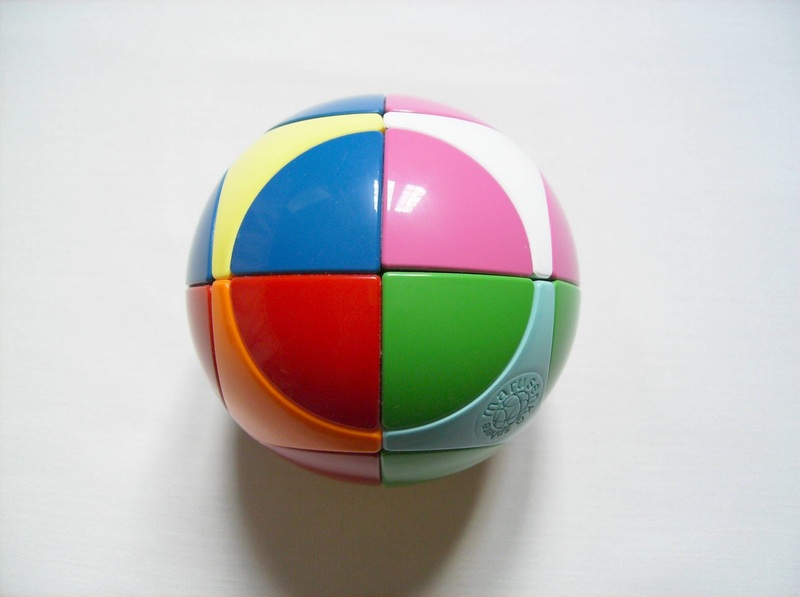 The balls are essentially a 3D sliding puzzle where you scramble the pieces and try to get them to their original pattern. The Bolaris Color is my favorite from the four, because it's not so difficult, but it sure provides a nice challenge without being too much frustrated. The Bolaris Globe, on the other hand, does look a lot better with the Earth representation, but it can be one hell of a headache to solve. Custom built by Kelvin Stott from Switzerland, the Qubami is a fantastic 3x3 Rubik-type cube with a twist. Think of it like a 3D Sudoku. There's three different colors and three symbols, and you have to solve it so that there's no two of the same colors or symbols in any row or column on each of its six faces. 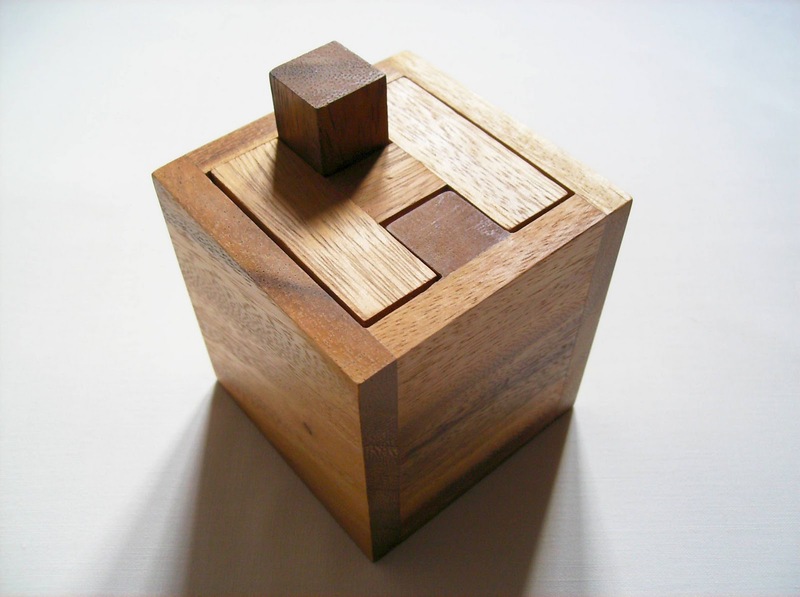 Designed by the genius of Oskar van Deventer, the Gear Cube was the first one in a new trend of twisty puzzles. There's been several new versions and sticker variations since its first release by Meffert's, but this one is still my favorite. 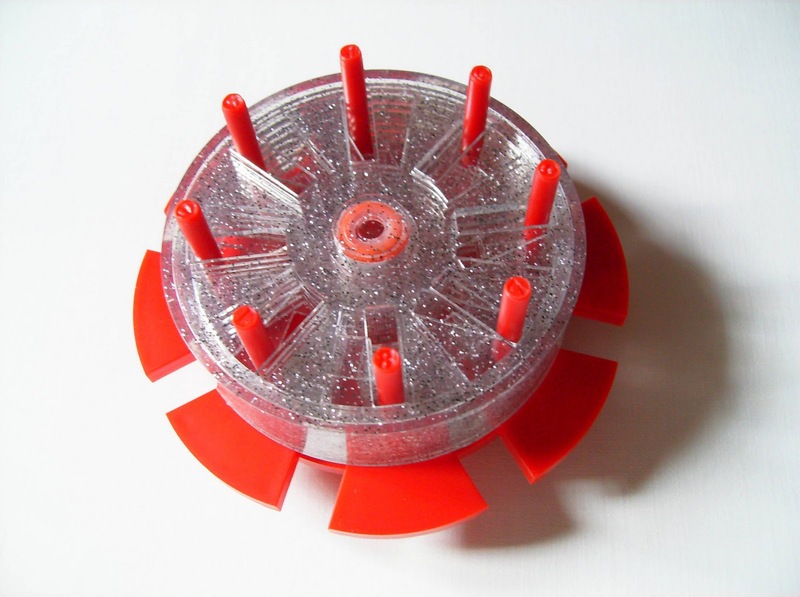 The gears that make the cube turn give a whole new dimension to this type of puzzle. Although it requires techniques to solve similar to the Rubik's Cube, it's still different in its own way and extremely fun to solve. We were first introduced to the Revomaze by Chris Pitt back in 2008. At the time they were only being made in metal and were very expensive. 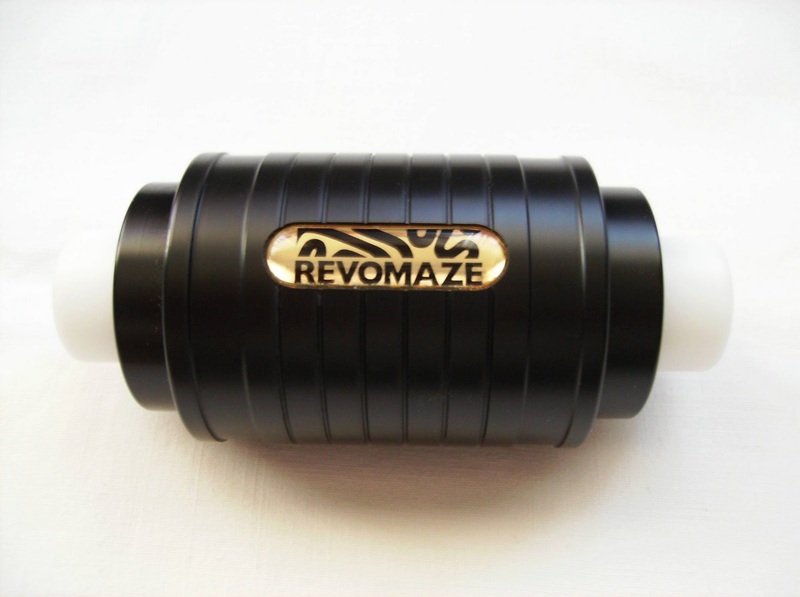 In order to get to a wider audience and to new puzzle enthusiasts, the Revomaze Obsession puzzles were launched two years later. By switching to plastic, the cost of production was considerably reduced and so the final price, although the overall quality of the puzzles remais very high. The Svetnashki is like a classic 15-Puzzle, but with a very cool concept that gives it a new life. 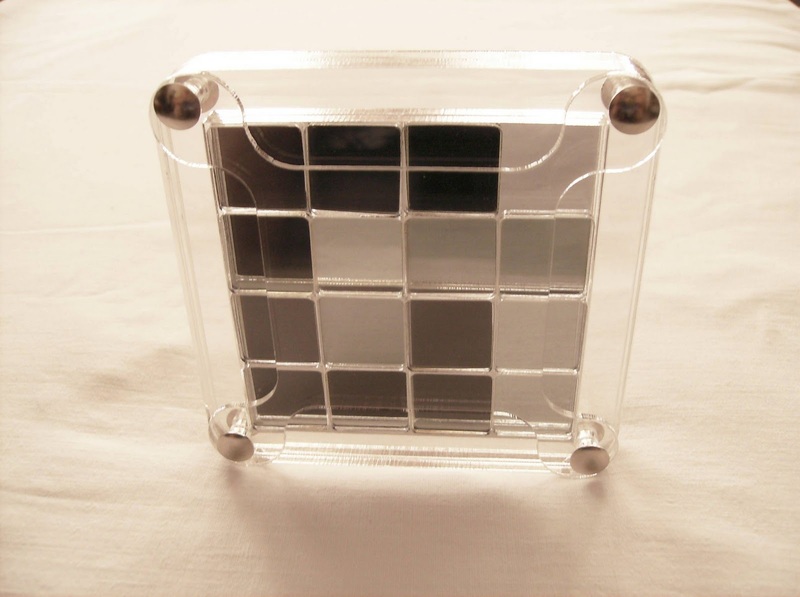 Built by the Russian company Mif Predmet, the Svetnashki makes a very clever use of polarized filters to change a clear tile into opaque when it passes in from of one. There's no unique goal though - You can turn all the tiles dark or clear, or you can just make your own designs. There were six different versions released (the one in picture is the 4x4 Classic), and the company had plans to release even more, but since then no others have been produced which really is a shame. I still love to play with them from time to time, just for the fun of it... I recommend it to everyone that likes slide puzzles or something out of the ordinary. Vinco, or Václav Obšivač is a fantastic craftsman. His designs are worthy to be in a puzzle museum. The Bicone was my first puzzle from him. Built from cherry and maple wood, it creates a rather beautiful checkered pattern. There are many different designs for this shape - Ten to be more precise. This particular one is called the Bicone 2 and the objective is to take apart the four interlocked pieces, but the process is not that simple. The method used to solve it is coordinated-motions, but once you're familiar with it, it just takes the time to find where all the pieces are connected. 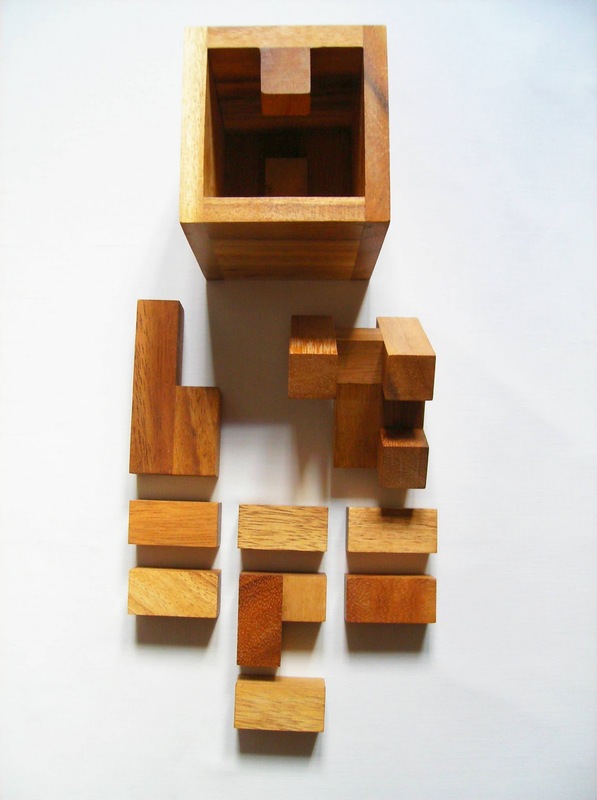 To find more of his amazing puzzles, visit his website. 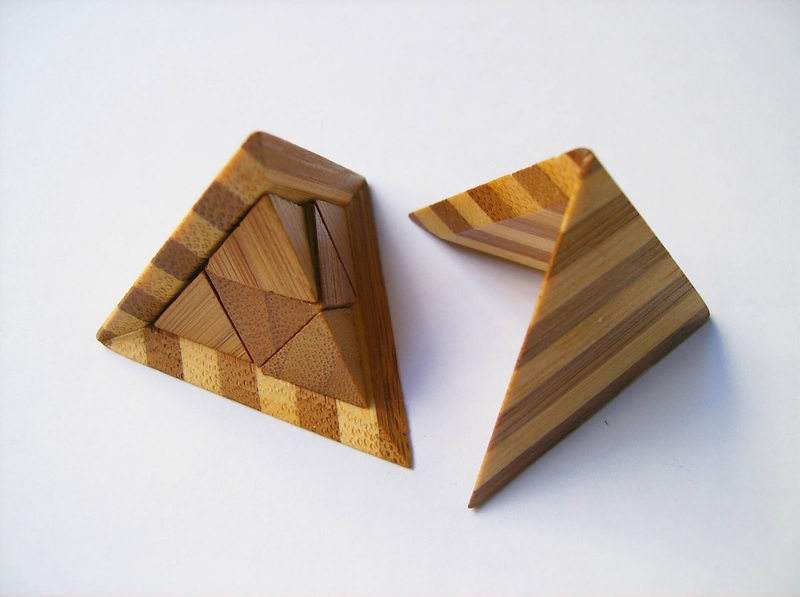 His puzzles are handmade and have very limited quantities, so don't just wait to get the one you're looking for. 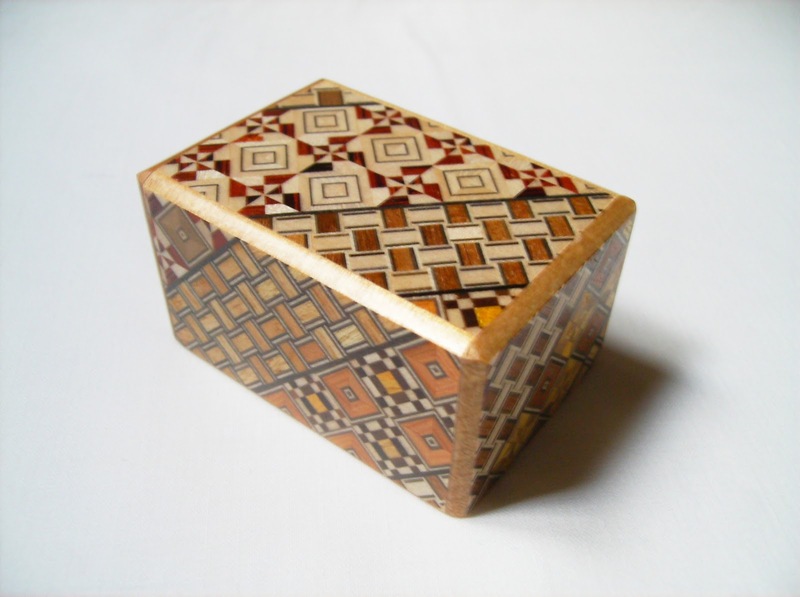 One of the most sought after puzzles from enthusiasts all over the world are the Japanese Puzzle Boxes. They are built by the best craftsmen in Japan and are decorated with all these distinctive and intricate patterns. 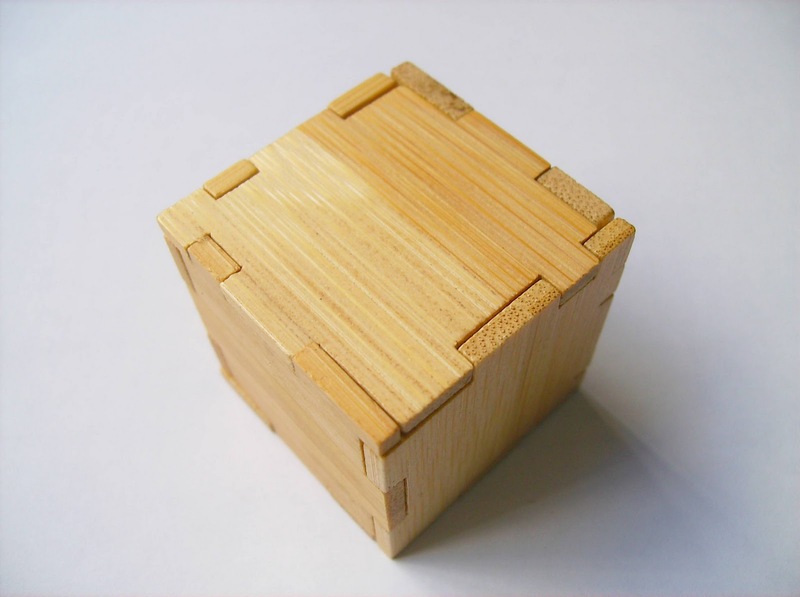 The puzzle itself is to find the correct sequence of sliding movements to open the box. The smaller ones are easier, but as you go higher in size and number of movements, it can get really difficult to open, with some of the hardest ones having hundreds of steps to solve. The particular one in the picture is actually a 2-in-1. The main box is 2.5 Sun with 5 Steps and inside it, there's a smaller Mame box with 22 Steps to open. 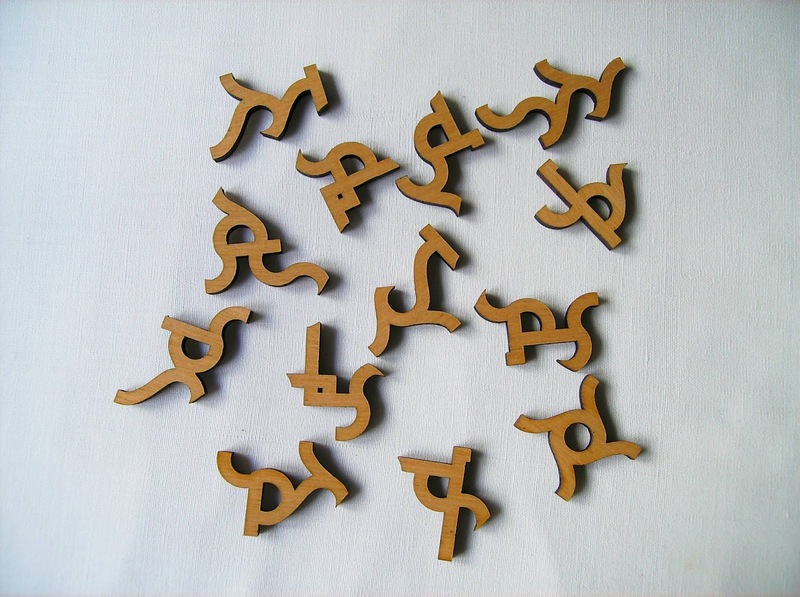 These ones, hopefully will be the first in many ahead, because I was completely amazed by their quality and the overall concept of the puzzle itself - to discover each correct movement to open them. ... And we finally get to my absolute favorite of the puzzles reviewed so far, and actually my favorite from my entire collection, because it holds a certain sentimental value that it's hard to get from a regular mass-produced puzzle. Call me egocentric, but how many people have the privilege of having a puzzle custom-made just for themselves? It doesn't get any rarer than this, as this is the only one in the world. 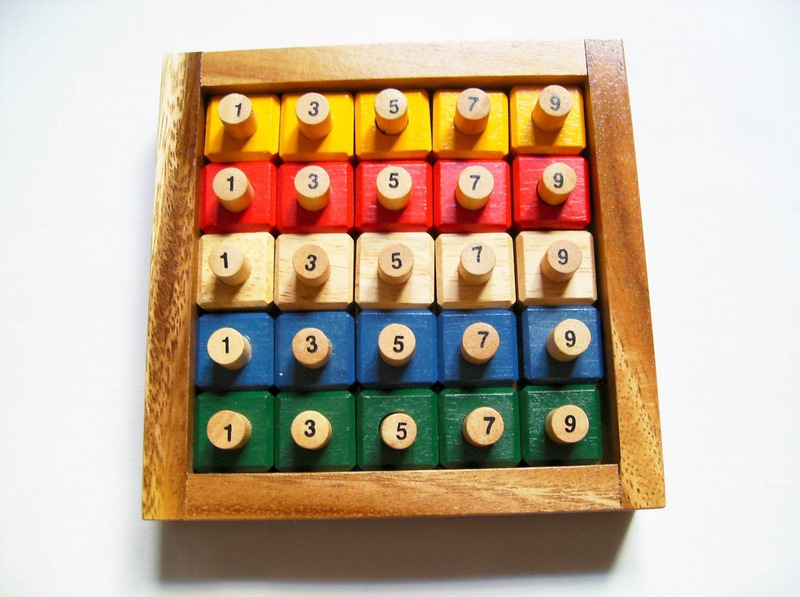 The Lexomino puzzles were created by Eric Harshbarger from the United States and are built from acrylic and plywood for the box. It consists of packing all of the pieces inside the box and be able to close the lid. It's a bit different from what you're used to, like in a simple Assembly puzzle, because the pieces won't just fit into the box by stacking them over each other. They interlock in many different ways to save space, and this is where it gets difficult, since there's thousands of possibilities, but only a fraction of correct solutions, maybe one in some cases. 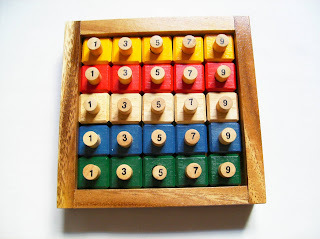 There's now a popular puzzle based on this concept, also by Eric, called Digits in a Box, but if you fancy one made with your name, you can contact the inventor and ask in more detail what you're looking for. Be warned though, not all letter configurations are solvable, so it has to be checked by Eric if it's doable. 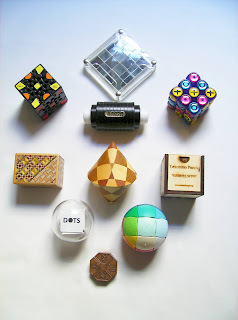 ... And there you have it, my favorite 10 puzzles from all my reviews. Who knows what puzzles I might choose for the 200th post? - Maybe a completely different top, but it would be very hard to change my top three. I hope my reviews are helping some of you to know new puzzles or to decide whether or not to buy the one you were looking for. If I succeeded in that job, then my work was totally worth it. Finally, I just would like to thank Roxanne Wong, Rob Stegmann, Georges Helm and Pantazis Houlis, for they're the ones responsible for me to start collecting all these extraordinary objects. They are more than just collectors, they have been contributing for years, with their work and knowledge and sharing their experiences with all the puzzle community, in one way or another. To them, I'm very grateful for that.